Press Releases – Protect Water for Future Generations. A updated Press Release will be posted soon. Clean Water Alliance recently completed research that reviewed studies about the connections between the surface water in Rapid Creek and two major underground aquifers, the Madison aquifer and the Minnelusa aquifer. According to the Rapid City Water Division, Rapid Creek and these two aquifers provide all of Rapid City’s water. The research summary paper is included for your reference. PIERRE – At a hearing on Jan. 18, Oglala Lakota tribal members and others took issue with state officials for approving a permit transfer that moves Canadian prospectors one step closer to their goal of large-scale Black Hills gold mining….Read more. July 27 – Oglala Lakota Receive Radiation Monitoring Training…Read more. July 1 – Media Advisory: INTERMOUNTAIN WEST URANIUM SUMMIT Calls for participation in our First Cross-Border Anti-Nuclear Action! …Read more. NUCLEAR REGULATORY COMMISSION RULES IN FAVOR OF OGLALA SIOUX TRIBE AND LOCAL CITIZENS…Read more. The federal government’s Nuclear Regulatory Commission (NRC) today supported the Atomic Safety and Licensing Board’s (ASLB) 2015 decision in the case about the proposed Dewey-Burdock uranium mine in Fall River and Custer Counties by ruling that the process for identification and protection of cultural and historical resources was not done properly. CHEYENNE RIVER STUDY SHOWS ELEVATED URANIUM IN ANGOSTURA RESERVOIR…Read More. Recent research by two South Dakota School of Mines and Technology scientists and a scientist from California State University-Fresno confirmed what we have long suspected – that elevated uranium levels are present in Angostura Reservoir in the southern Black Hills. The study tested stream sediments along the Cheyenne River watershed from old abandoned uranium mines to Angostura Reservoir. For the full CHEYENNE RIVER STUDY click here. Clean Water Alliance, Dakota Rural Action and It’s All About the Water: NUCLEAR REGULATORY COMMISSION RULES IN FAVOR OF OGLALA SIOUX TRIBE AND LOCAL CITIZENS…Read more. Dakota Rural Action and Clean Water Alliance: MAPPING PROJECT SHOWS URANIUM COMPANY CLAIMS AROUND BLACK HILLS…Read more. Dakota Rural Action and Clean Water Alliance: EXPERT: CONTAMINATION OF GROUND AND SURFACE WATER AT URANIUM MINE SITE TO BE EXPECTED, IF MINING OCCURS…Read more. Dakota Rural Action: INFORMATION NIGHT REGARDING ISL URANIUM MINING IN CUSTER AND FALL RIVER COUNTIES…Read more. 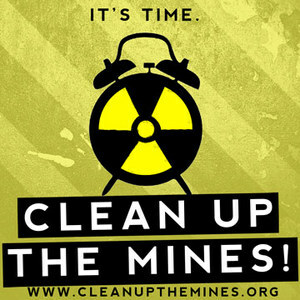 Clean Water Alliance: FEDERAL ENVIRONMENTAL PROTECTION AGENCY ISSUES PRELIMINARY ASSESSMENT ON URANIUM MINE CLEAN-UP…Read more. Clean Water Alliance: NRC DOCUMENT ON PROPOSED URANIUM MINE IS DEFICIENT: STATE PROTECTION NEEDED…Read more. Dakota Rural Action: No Large Scale Mining Permit to be Issued to Powertech This Year…Read more. Powertech Uranium Corp: Azarga Resources finances Powertech for permit process…Read more. Dakota Rural Action – Rapid City Council Passes Resolution Expressing Grave Concern about Proposed Uranium Mining…Read more.